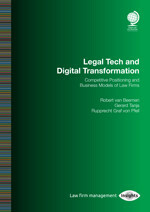 What impact do technology, legal tech and technology-based legal services have on the formulation of strategy in traditional law firms? Does legal tech affect the competitive positioning of law firms? Legal tech and client services delivery: will the distinctive value proposition of law firms change? How does legal tech impact the traditional business models of law firms? How do national and international law firms implement technology in their business model? What are best practices and what can we learn? The report concludes with a commentary on the perspectives law firms should consider in regard to legal tech companies and legal process outsourcing (LPO) providers (and how should they respond). Will we see mergers between law firms and such new entrants and legal tech companies? How will the 'Big 4' embed legal tech in their services and where will they try to compete?